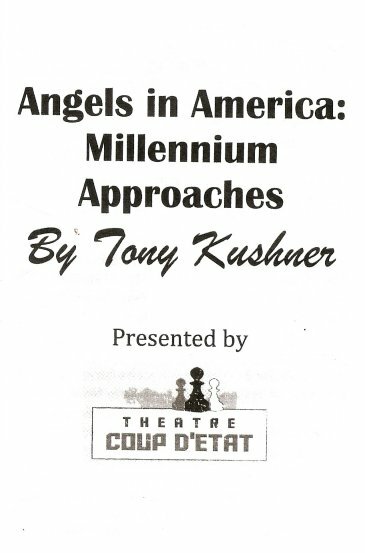 I had never seen Tony Kushner's masterpiece two-part play Angels in America live on stage before last week (in fact the only time I've seen Kushner plays is at "KushnerFest" at the Guthrie three years ago). But I fell in love with Angels in America through the 2003 HBO mini-series and have since been eager to see it on stage. So when I heard that local theater company Theatre Coup D'Etat (which I'd never heard of before) was performing the first part, Millenium Approaches, I jumped at the chance to see it. It was as I remember the TV adaptation to be - powerful, compelling, perplexing, and moving. After it ended, I found myself wondering when Theatre Coup D'Etat will present the second part, subtitled Perestroika, so that I can spend more time with these sympathetic and/or infuriating characters. The play centers around two couples. Joe and Harper are a married Mormon couple that is struggling: Joe because he's gay but, like a good Mormon, has learned to "Turn it Off," and Hannah because of her addiction to pills in attempt to cope with that unspoken fact. As a result, she's clingy, terrified, and suffers from hallucinations. Joe has been offered a job in DC but doesn't want to take it because of how it will affect Harper. Joe's co-worker, Louis, is the first to confront Joe with the fact that he's gay. Louis himself is having a hard time because his partner, Prior, has AIDS and is in declining health (Louis is the infuriating character I referred to earlier). He turns his partner's illness into his problem; Prior is lying on the floor in pain, and Louis cries, why is this happening to me! He ends up leaving Prior, unable to handle his illness. It's easy to label Louis as a jerk because of this, but who really knows how they'd react to that situation unless they're in it? We'd all like to think we'd stand by someone we loved going through a terminal illness, but Louis is the embodiment of that tiny part of us that questions if we'd have what it takes. But Prior isn't left totally alone, he has his fiercely supportive friend, the drag queen/nurse Belize. And he has his hallucinations - of his ancestors who also died young, and an angel who comes to visit him in his sickbed. This is where the play ends, with much more to be explored. The staging of the play is very simple, with black boxes serving as chairs, beds, bars, coffins. That and the intimate space at the Lowry Lab puts the focus on the actors and the emotions of the piece. At the heart of the piece is James N. Stone as the ailing Prior. He takes the character from healthy and making light of his illness, to writhing on the floor in pain, to dressing in drag as a comfort, and he carries the audience on the journey with him. Veteran actor Steven Flamm (he's been acting in the Twin Cities for over 40 years) is the gay lawyer who also has AIDS, but denies both facts to maintain his reputation as a high-powered attorney. Despite this, Steven manages to make him a likeable and compelling character. Michael Brown (that promising young actor from American Family at Park Square) shows more of his talents as Prior's friend Belize (think True Blood's Lafayette). Megan Down manages to make Harper crazy and sympathetic (in a much different role that her recent appearance in the farce Absolute Turkey at the Gremlin). Also good are Peter Beard as the closeted Joe who slowly comes unhinged, Brandon Caviness as Louis, and Katherine Preble as the wise rabbi who later transforms into a nurse and an angel. 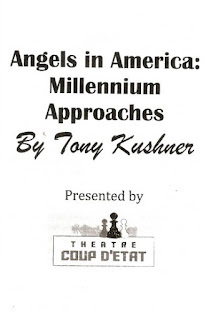 Angels in America: Millennium Approaches continues through August 4 at the Lowry Lab in downtown St. Paul, and will then move across town to In the Heart of the Beast for a few weeks in late August. Definitely worth checking out to see this American classic. But it's not a short play - with three acts, two intermissions, and a total running time of 3+ hours, you'll want to go in fully rested and/or get some caffeine (advice that I unfortunately did not take). And with any luck, we'll have a chance to see Part 2 sometime in the not too distant future. (Goldstar half price tickets available for the Lowry and In the Heart of the Beast).